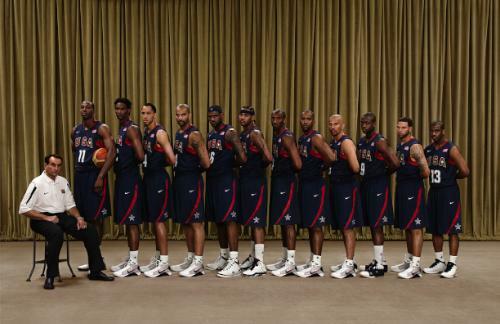 An interesting image broke a few weeks ago of the US mens Olympic Basketball team in their new Nike designed uniforms. The offending piece centered around mens coach Mike Krzyzewski covering Dwight Howards adidas sponsored footwear – blocking the 3 stripes from display. Further controversy surrounded the image was directed at Howard, who while holding the ball blocked the Nike swoosh with his dangling arm. Nike have invested hundreds of millions of dollars on sponsoring the US team and it’s in their best interests to protect where possible the whole experience from head to toe. In team sports it should be expected that individual stars have their own deals that can often compromise the exclusivity and impact the teams endorser stands to gain. Take for example Ronaldinho (Brazilian sccer star), at Barcelona he was head to toe a Nike guy, they used him in almost every campaign piece – such is his iconic status and reach. This week Ronaldinho signed for AC Milan, an adidas endorsed team. Adidas immediately announced that they had pre orders of 11,000 Ronaldinho shirts within 2 hours of his shirt number announcement. Nike, like most sports brands, would rather a situation exist where an authentic end-to-end Nike branded experience can be communicated to its audience. Until last week that was exactly what happened whenever he stepped out for FC Barcelona. In contrast Ronaldinho now dones the 3 stripes, with limited visibility given to his Nike sponsored boots. Past rumors within sport marketing circles tell stories of certain brands paying big money to keep their major stars contracted to teams that have endorsement deals with their brand. The ability to control the whole experience is a scenario any sports manufacturer would want, as the ultimate platform to showcase their brand. I predict the ability to control this seamless experience to become even more of a prevailing trend in the years to come. While I was away my friend at Truebranding Melissa posted an article on Brand Channel regarding the Olympic brand and China. A very well wrote and thought through piece. Also a few interesting quotes from someone well known to this site. As the Olympic torch continues its journey around the world on route to the Beijing Olympic stadium, the level of public disapproval to China and its policies shows no signs of abating. The Olympic flame with its supposed symbol of peace and hope are being met with protestors everywhere who are angry about Chinas role in Sudan and their reckless policy in Tibet. Not only is it damaging the Beijing games but it is also damaging the Olympic brand. The Chinese games are a bold move by the IOC to bring the rings to all corners of the world. Slowly that ideology is being eroded by what is uniting pressure from public opinion. The torch relay is meant to signify the purity of the games, coming from its ancient home in Olympia, Greece to its final resting point high above the Olympic stadium. The fact it passes through so many territories on route acts as a testimony to mankind that we are better off acting together and living in peace, with respect for one another. The current perception of China goes against these ideals and puts at its very heart the belief people can put behind the principles of Olympism and the games. Only time will tell how China can turn this around.